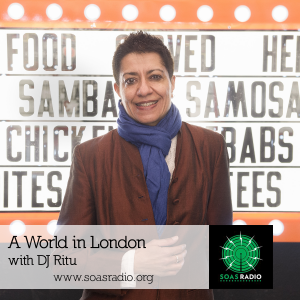 DJ Ritu, pioneering international turntablist & BBC Radio presenter, hosts/produces A World in London at SOAS Radio, University of London, and at Resonance 104.4FM. In the ‘90s she co-founded Outcaste Records, signing Nitin Sawhney and Badmarsh & Shri. She has toured extensively in over 30 countries with her bands Sister India and the Asian Equation, performing at major venues and festivals including The Big Chill, WOMAD, The Royal Festival Hall and Trafalgar Square. Joining BBC London in 2006, she inherited Charlie Gillett’s slot, and then expanded it into ‘A World In London’. The show is recognized as an essential meeting point for world music fans and a hub for the industry. It has an unrivalled reputation for presenting a rich cultural mix that truly reflects the diverse musical tastes of London and its people. Guests include international stars such as Tarkan, Angelique Kidjo, Bebel Gilberto, AR Rahman, and Esma Redzepova, though the show aims to champion local up & coming talent. Her other weekly show for BBC Three Counties Radio ran for over 20 years and was syndicated in Germany, Turkey & Sweden. Ritu has also broadcast for BBC World Service, Kiss 100, and other stations. Rough Guides CD compiler, and EBU chart panel member, Ritu manages two London club nights: Kuch Kuch and Club Kali which are the longest running Bollywood events in the UK. A musical chameleon, her repertoire includes Soul, Disco, Motown, Pop, Drum n’ Bass, as well as Turkish, Greek, African, Latin, and Middle-Eastern sounds. She regularly comperes at various festivals and appears often at The Southbank Centre, Rich Mix, and various nightspots!